"As I was transitioning, I had to share with my parents that I was indeed transgender ... More than telling them that I was trans, it was them seeing me being more comfortable with myself." When she was a teen, Aquino moved alone from the Philippines to the United States to study music in Boston. She attended the Berklee College of Music and went on to perform as Juliet in a performance of "Romeo and Juliet" in New York City’s Bryant Park. 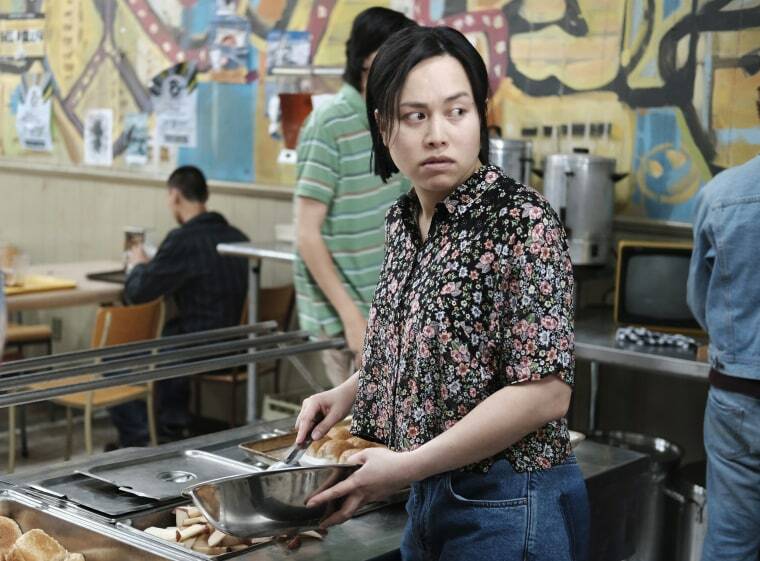 Last month, Aquino made her network television debut in the role of transgender activist Cecilia Chung on ABC miniseries “When We Rise.” It’s Aquino’s first time portraying a transgender character. “I hope that it really is the beginning of something — it’s a step toward greater visibility for the community, for minority communities, including the API community in the media,” she said. The series highlights the struggles and triumphs of the LGBTQ rights movement over the decades and community efforts to rise together in unity. Aquino said she found many common threads and parallels between herself and Chung — who is currently a senior strategist at the Transgender Law Center during filming — including the yearning to reconcile with family and the fight for equality. “I’ve learned so much from her in terms of the love for the community and her story. In ‘When We Rise,’ it’s really emerging from living a life on the streets to that of advocating for the community. So she has not only made a better life for herself, but continues to contribute,” Aquino said, noting that viewers are first introduced to Chung as she experiences homelessness and estrangement from her family. Aquino met Chung for the first time over dinner after filming the first few scenes of part three of "When We Rise." The next day, she had the opportunity to shadow Chung during a conference on transgender women and HIV. “I was able to watch her in action and saw how passionate she was and that she had all this fire when we spoke about issues she was advocating for. Underneath that fire is a huge heart, and that combination I saw was so informative in my portrayal of her in the series,” Aquino said. In response to the reversal of bathroom protections for transgender students and the Supreme Court’s decision not to hear a transgender rights case, Aquino said that transgender people should be able to feel comfortable using a public restroom that corresponds to who they are. Earlier this year, Aquino shared her story as a transgender actress at the Television Critics Association conference, recounting an experience in which a friend of a friend expressed his dislike toward the LGBTQ community in front of Aquino. At that moment, Aquino said she knew she had a choice to make: remain silent or say something. Aquino said she was glad she made the choice to speak out because it allowed for conversation and made the person see a human face to the stories. She hopes "When We Rise" can serve that purpose for a wider audience and lauds Black and his team for being committed to having a transgender actress play a transgender role. She adds that directors and producers should be open to casting the best actor and actress for the role. "And that includes casting someone who is trans in a role that's not necessarily trans, because once that happens, when it all boils down to who gave the best audition or who is the best actor regardless of gender identity, then we really get down to...it is also a more accurate reflection of the society we live in now," she said. Growing up in the Philippines, Aquino would hide underneath the family table and reenact scenes from her favorite movies and cartoons. It was a safe space where she could be the author and actress of her own story. “I would go into these scenarios, and it felt safe for me because, looking back, I realized I would be stepping into the shoes of a character ... it did develop my empathy early on,” she said. As she grew older, Aquino regularly watched the Miss Universe pageant and spent hours reading stories from women’s magazines, feeling empowered and inspired to chase after her dreams. Aquino said she is fortunate enough to have loving and supportive parents who encouraged her to pursue her dreams. But growing up, she didn’t always see herself reflected in the media. Aquino was often bullied at school, but she never let the negative energy or the harsh words from her peers get under her skin, she said. By the time she was in high school, Aquino would rummage through her mom’s closet, wearing heels and applying makeup. “At some point in high school that desire to express that need in me was so strong that one summer I ended up plucking my eyebrows and colored my hair, and I walked into school and there was a collective gasp in the classroom in the change of appearance,” she said. Aquino started hormone therapy in her mid-teens and had gender confirmation surgery in her mid-twenties. "I hope that it really is the beginning of something — it’s a step toward greater visibility for the community, for minority communities, including the API community in the media." “As I was transitioning, I had to share with my parents that I was indeed transgender ... More than telling them that I was trans, it was them seeing me being more comfortable with myself,” she said. Since then, life has been rewarding for Aquino. “For me to have [played Juliet] that in front of tens and thousands of people in Bryant Park, it was a dream come true and the role of Cecilia [in ‘When We Rise’] came along and I realized that by doing that, I would really be moving from being a private citizen to more a public figure because of the visibility of the show,” she said. “When We Rise” is very much a show about families, Aquino said, and throughout the filming of the series, Aquino has been overwhelmed by the love and support from her own family. One of the most touching experiences she’s had since the premiere of “When We Rise” was when her father shared a People.com interview she had done and expressed his support for his daughter. “I saw on Facebook that my dad had reposted and shared the post and pretty much said, ‘I’m so proud of my child,’ and that really was touching because Asian families are not traditionally very vocal and so to see my father post that was really touching,” she said.